The advent of evidence based medicine has generated considerable interest in developing and applying methods that can improve the appraisal and synthesis of data from diverse studies. Some methods have become an integral part of systematic reviews and meta-analyses, with reviewers, editors, instructional handbooks, and guidelines encouraging their routine inclusion. However, the evidence for using these methods is sometimes lacking, as the reliance on funnel plots shows. The funnel plot is a scatter plot of the component studies in a meta-analysis, with the treatment effect on the horizontal axis and some measure of weight, such as the inverse variance, the standard error, or the sample size, on the vertical axis. Light and Pillemer proposed in 1984: “If all studies come from a single underlying population, this graph should look like a funnel, with the effect sizes homing in on the true underlying value as n increases. [If there is publication bias] there should be a bite out of the funnel.”1 Many meta-analyses show funnel plots or perform various tests that examine whether there is asymmetry in the funnel plot and directly interpret the results as showing evidence for or against the presence of publication bias. 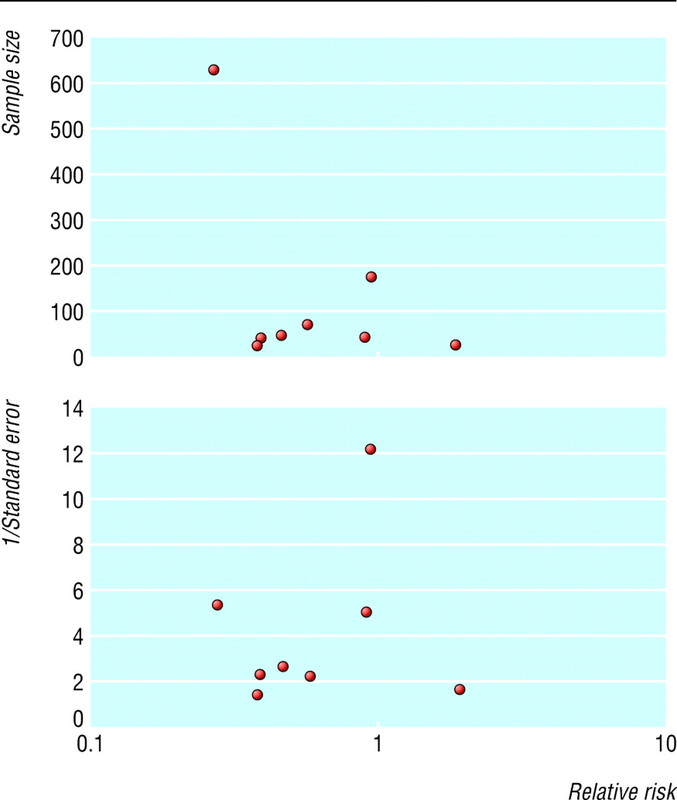 Hand searching of the BMJ from July 2003 to June 2005 shows that funnel plots were mentioned in 20 of the 47 systematic reviews that included some quantitative data synthesis (see bmj.com for full details). In all 20 cases, the plots were mentioned specifically as tests for evaluating publication bias. Four of the 20 systematic reviews eventually did not perform these tests because they felt too few studies were available (maximum 3 to 10 per meta-analysis), one made no further mention besides the methods, and only one performed the tests and acknowledged that “the funnel plot may not detect publication bias when the number of studies is small.” The other 14 systematic reviews did not question the inferences from these tests and typically made categorical statements about conclusively finding or excluding publication bias with these methods. A total of 34 meta-analyses had been evaluated with these methods: 14 of them had nine or fewer studies and 18 of them had significant between-study heterogeneity; only five of the 34 meta-analyses had 10 or more studies and no significant between-study heterogeneity. Although 10 studies is not an adequate number for the funnel plot,7 we chose it as a cut-off to show that systematic reviewers did not meet even this liberal criterion. The evaluation of a methodological test is directly analogous to the evaluation of a clinical diagnostic test. Fryback and Thornbury have proposed a six level model for evaluating a diagnostic test.8 This provides a good discussion framework. The six expectations of a clinical diagnostic test are technical feasibility, diagnostic accuracy, diagnostic effect, treatment effect, effect on patient outcome, and societal effect. If the conclusions of evidence based medicine are based on poor tests, the negative effect eventually may be considerable. So we must examine closely at least the technical feasibility and diagnostic accuracy of these methods. An evaluation of the technical feasibility of the funnel plot shows many problems that are difficult to solve. Strong empirical evidence exists that the appearance of the plot may be affected by the choice of the coding of the outcome (binary versus continuous),9 the choice of the metric (risk ratio, odds ratio, or logarithms thereof), and the choice of the weight on the vertical axis (inverse variance, inverse standard error, sample size, etc).1011 Figure 1 gives an example of how these choices can make a difference. Even in the unlikely event that agreement is reached on what metric and what expression of weight to use on the axes, enormous uncertainty and subjectivity remains in the visual interpretation of the same plot by different researchers. Our team recently designed a survey to examine this question using simulated plots with or without publication bias.12 The ability of researchers to identify publication bias using a funnel plot was practically identical to chance (53% accuracy). Formal statistical tests may eliminate the subjectivity in visual inspection of asymmetry. Investigators commonly use the rank correlation test13 or one of many tests based on regression.27101114 The validity of these tests depends on assumptions often unmet in practice, however, and the choice of test introduces further subjectivity into the procedure. The methods theoretically require a considerable number of available studies, generally at least 30 for sufficient power. But the number needed depends on the size of the studies and on the true treatment effect—for example, for an odds ratio of 0.67, even 60 studies are not adequate.7 Most meta-analyses of clinical trials, however, have far fewer studies. For instance, the average Cochrane meta-analysis has fewer than 10.15 Thus the tests typically have low power16 and may be inappropriate. 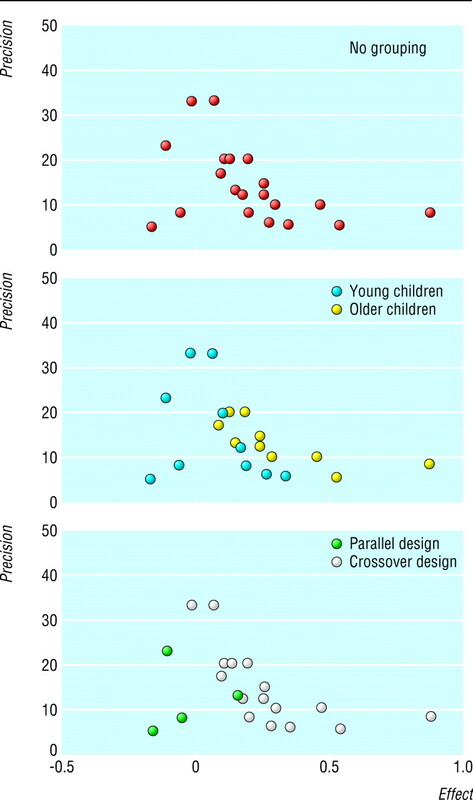 For example, figure 2 shows the funnel plot for a meta-analysis of inhaled disodium cromoglicate as maintenance therapy in children with asthma.24 The authors found both statistical and clinical heterogeneity, yet they published a funnel plot (fig 2, top), stating: “Studies with low precision and negative outcome are under-represented, indicating publication bias.” Grouping the studies according to age of participants (middle) and study design (bottom) creates a different impression. Finally, we have no gold standard against which to compare the results of funnel plot tests. A true standard measure of publication bias would require prospective registries of trials with detailed knowledge of which studies have been published and which are unpublished. It would then be feasible to test whether tests of publication bias capture accurately the presence of unpublished studies and whether one variant performs better than others. Given that efforts for study registration have only recently started,25 this evaluation is currently difficult. Although a large number of alternative tests for publication bias exist,26 none has been validated against a standard. In conclusion, evidence based methods, including the funnel plot, should be evidence based. If treatment decisions are made on the basis of misleading methodological tests, the costs to patients and society could be high. Decisions guided by the easy assurance of a symmetrical funnel plot may overlook serious bias. Equally, it may be misleading to discredit and abandon valid evidence simply because of an asymmetrical funnel plot. The prevention of publication bias is much more desirable than any diagnostic or corrective analysis. Contributors and sources The authors have worked for a long time on methodological research in systematic reviews and meta-analyses. The idea was generated by JL and expanded by the other authors. The manuscript was written by JPAI and JL and commented on critically by the other authors. All authors approved the final version. JL is the guarantor. Funding Supported in part by AHRQ grant R01 HS10254. Competing interests: None declared.
. Summing up. The science of reviewing research. Cambridge, MA: Harvard University Press, 1984.
eds. Cochrane reviewers' handbook 4.2.2 [updated March 2004]. In: Cochrane Library, Issue 1. Chichester: Wiley, 2004.
. Improving the quality of reports of meta-analyses of randomised controlled trials: the QUOROM statement. Quality of Reporting of Meta-analyses. Lancet 1999;354: 1896–900. et al. Meta-analysis of observational studies in epidemiology: a proposal for reporting. Meta-analysis Of Observational Studies in Epidemiology (MOOSE) group. JAMA 2000;283: 2008–12.
. Quantitative synthesis in systematic reviews. Ann Intern Med 1997;127: 820–6.
. A comparison of methods to detect publication bias in meta-analysis. Stat Med 2001;20: 641–54.
. The efficacy of diagnostic imaging. Med Decis Making 1991;11: 88–94.
. Is the placebo powerless? Update of a systematic review with 52 new randomized trials comparing placebo with no treatment. J Intern Med 2004;256: 91–100.
. Funnel plots for detecting bias in meta-analysis: guidelines on choice of axis. J Clin Epidemiol 2001;54: 1046–55.
. Misleading funnel plot for detection of bias in meta-analysis. J Clin Epidemiol 2000;53: 477–84.
. Operating characteristics of a rank correlation test for publication bias. Biometrics 1994;50: 1088–99.
. Publication and related bias in meta-analysis: power of statistical tests and prevalence in the literature. J Clin Epidemiol 2000;53: 1119–29.
. An empirical study of the effect of the control rate as a predictor of treatment efficacy in metaanalysis of clinical trials. Stat Med 1998;17: 1923–42. et al. Early or deferred zidovudine therapy in HIV-infected patients without an AIDS-defining illness. Ann Intern Med 1995;122: 856–66.
. Evolution of treatment effects over time: empirical insight from recursive cumulative meta-analyses. Proc Natl Acad Sci USA 2001;98: 831–6.
. Investigating and dealing with publication and other biases. In: Egger M, Davey Smith G, Altman DG, eds. Systematic reviews in health care: meta-analysis in context. London: BMJ Books, 2001.
. Adjusting for publication bias in the presence of heterogeneity. Stat Med 2003;22: 2113–26.
. Meta-regression detected associations between heterogeneous treatment effects and study-level, but not patient-level, factors. J Clin Epidemiol 2004;57: 683–97.
. Inflation of type I error rate in two statistical tests for the detection of publication bias in meta-analyses with binary outcomes. Stat Med 2002;21: 2465–77.
. Inhaled disodium cromoglycate as maintenance therapy in children with asthma: a systematic review. Thorax 2000;55: 913–20. et al. Clinical trial registration: a statement from the International Committee of Medical Journal Editors. JAMA 2004;292: 1363–4. eds. Publication bias in meta-analysis. Prevention, assessment and adjustments. Sussex: John Wiley and Sons, 2005.